If I had a nickel for every time I've heard this comment I'd have enough money for lunch. Typically it means that fire can be seen from a window or the roof, but does that really mean that the strategic goal of ventilating the structure has been met? Consider these words from Battalion Chief Kriss Garcia from Salt Lake City Fire Department, one of the leading proponents of positive pressure ventilation and positive pressure attack. "Having fire come out of an opening is not ventilation. It is fire coming out of a window. Ventilation is the coordinated effort of the fire attack crew to remove products of combustion from the interior of the building while replacing it with a tenable environment (emphasis added) [...] Just because you have fire showing does not mean you have ventilation.You may have some but you have not taken control of the interior environment." Consider this image of a residential structure fire. Fire is "venting" (i.e., exhausting) from the D-side gable. But has the smoke been replaced with fresh air? If yes, then why is smoke showing from the eves under pressure? Remember, most "fire" fatalities are caused by smoke, so removal of smoke from a building should be a very high (and early) priority! Not just an after-thought after the fire is out. Our citizens aren't wearing air packs. "There is a dearth of available literature pertaining to the impact of human facts on effective fireground communication […] while fire departments devote substantial time to manipulative skill training, relatively little training is provided to help firefighters develop stress-tempered communication skills." If something is tempered (like tempered glass or steel) then it is made hard, flexible, or resilient by heat and/or chemical treatment. Quite simply, stress-tempered communication is communication under stress. Stress is biological reaction to fear. It's the "fight or flight" syndrome sometimes referred to as the adrenal state. The adrenal state was quite helpful a million years ago, and in some situations it is still helpful. However, in emergency work the adrenal state can be debilitating. In short, during the adrenal state, your brain reverts to a more primitive mode. I've adopted the term "monkey brain" to describe this phenomenon (credit to Dog Brothers Martial Arts). When that happens, you fall back on your training. Good habits and bad. This is one of the main reasons I believe in reality-based training. If you practice without your gear on, or practice without masking up, putting on your flash hood, donning your gloves, checking your partner, flaking out the line, charging the line, bleeding the line, checking the pattern, making entry, controlling the door, popping a ceiling tile, using the TIC, and so on, then you shouldn't be surprised if your crew forgets any of these basics on the fireground! What does this have to do with scene size-up? Have you ever wondered why an otherwise good officer arrives on scene and forgets to give a brief initial report? Gives an incomplete report? Forgets to take command? Fails to announce the strategic mode? Doesn't hear the battalion chief calling them on the radio? It's easy when you're sitting around the kitchen table. It's another matter to be woken up from deep sleep and pull up in front of a raging fire 5 minutes later. Now imagine a woman in her nightgown reporting a missing child. How do you develop stress-tempered communication skills? The answer is, you identify the expected performance, simulate the stressful stimulus, and repeat the desired behavior over and over again until it becomes second-nature. Can you really simulate that kind of stress? You can come close. One thing I've noticed about firefighters is that they don't want to look foolish in front of their peers. Collect some photos of fires in various stages of burning. Post them into PowerPoint. Give each firefighter a radio and put them on a "talk-around" channel (this is critical). Tell them that all of the incidents will take place on "Maple Street". You can find some excellent photos in Christopher Naum's "Five Minutes in the Street" and "Ten Minutes in the Street" series at Firefighter Nation (see examples here, here, here, here, here, here, here, here, here, here, here, here, here, and here). When it's their turn in the hot seat, give them 5 seconds to digest the photo and make them give a brief initial report on the radio. By making them key up the mic in front of their peers, you will avoid the situation in which the firefighter talks to himself. "Okay.... let's see.... it's a single story woodframe residential..... Okay...... There's smoke showing...... From side..... Well, fire and smoke...... Would you mention the cars in the driveway?" There's no time to talk to yourself when you give a scene size-up on the radio in middle of the night, so when you practice this skill, make them key up the mic and give the complete size-up, warts and all, until they are done! Then discuss what you would have done. I make each member of my crew hit 5 bullet points in order (this can be customized to your department but you should make them do it in the order you prescribe because it makes them think under pressure and repetition is the mother of learning). Here are the points I make them hit. "Dispach, Engine 1 is on location. We have a large 2-story woodframe residential structure with cars in the driveway. We have smoke and fire showing from 2 windows, Division 2, A-D corner. Engine 1 is establishing Maple Street Command. We're in the offensive strategy. This is a working incident." When they're done, you can critique the size-up based on your departments SOGs. Make them do it again. And again. And again. Until it's perfect. Then pass the radio to the next guy. Does this put people on the spot? Yes! Do firefighters like that? No! I've noticed a dramatic improvement in my crew's ability to give a brief initial report, and I feel better about it, too. Am I saying that I couldn't pull up in front of a fire next shift and screw it all up? Of course not! There's a fire out there that could make a "monkey" out of any of us. On the other hand, the odds of my performing a good scene size-up and giving an accurate and concise brief initial report has gone up considerably because I've done my part to help develop stress-tempered communication skills. Give it a try and let me know your experiences! In my opinion, one of the best TV-miniseries ever made is From the Earth to the Moon, produced by Ron Howard and Tom Hanks in the late 1990's. The twelve-part series chronicles man's journey to the moon. It's well known for the accuracy of its portrayal of the Apollo program and for outstanding special effects. I'd put in in the same league as Band of Brothers. Every episode was fantastic, but I'd like to tell you about episode 11, Galileo Was Right, which tells the story of Apollo 15. This was the first "J mission" which means the astronauts stayed on the moon longer, were the first to use the Lunar Rover, and were the first to prioritize lunar field geology. It's important because it was believed that while astronauts were the some of the best pilots in the world, they did not possess "scientific minds". It was astronaut Harrison "Jack" Schmidt (a civilian geologist) who convinced NASA to bring in Professor Lee Silver from Caltech to "bring out the scientific mind in all of them." Professor Silver was exactly the kind of instructor most firefighters would enjoy having. He took the astronauts out to the Orocopia Mountains and taught them how to size up the terrain and describe it over the radio in a language that geologists back at NASA could easily understand. During the training, one astronaut would go out into the field wearing a mock-up of the pack they would carry on the moon. Using a walkie-talkie, the astronauts would go to the highest place they could find and give a size-up of the terrain to another astronaut back in the base camp. The second astronaut would then draw a picture of what the first astronaut described. In the beginning, the astronauts had no idea how to describe what they saw. They would fumble through their radio report, and the picture the other astronaut drew would look nothing like the terrain the first astronaut was looking at. Then something happened. The astronauts learned the language of geology and they got better because they practiced. The radio reports became concise and accurate. The sketches started to match the terrain. 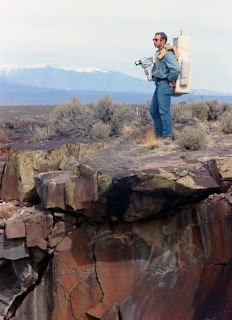 In short, they become skilled field geologists. Commander David Scott and Lunar Module Pilot James Irwin went on to land on the moon at Hadley Rille near the Apennine Mountains and bring back to Earth the so-called "Genesis Rock" -- a 4 billion year old piece of the moon's primordial crust. What language do you speak when you pull up in front of a structure fire? Do you speak the language of a fire service professional? Are you knowledgeable about building construction? Can you read smoke? How well can you describe what you see? Do you provide context? How is your command presence? Scene size-up is a skill that can be practiced. Just ask the crew of Apollo 15. If you gave yourself a good report card, there are three possible explanations. Either you have a lot of experience, you've practiced a lot, or you're not as good as you think you are. There are very few natural-born incident commanders. We're blessed to be in a career that offers us the opportunity to make a real difference in the lives of others who are quite possibly having the worst day of their lives. It's a huge responsibility that requires character, competence, humility, and a commitment to excellence. These traits don't develop themselves, and in our line of work, there are no second chances. At least, not for the victim of today's emergency. If you knew that sometime in the next 365 days, a life-or-death situation would develop for you or a member of your crew in your first-in district, would it make a difference in how you spent your next shift? Your next 10 shifts? Would you train more? Do more pre-incident planning? Concentrate on self-survival skills?Incident command? Risk management? Stress tempered communication? Air management? It's not given to us to know when these skills will be required. It's possible that our entire careers will boil down to a single moment in time when we either have the knowledge, skills, and abilities to save a life, or we don't. This is an incredible video that every firefighter needs to watch. 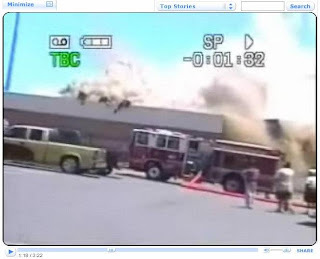 Click HERE to view an excellent near-miss video at a commercial fire. June 5, 2008 - Firefighters from Sacramento Fire Department narrowly escape death or catastrophic injury as they ventilate a truss roof at a beauty supply business. There is a new Training Minutes video series at Fire Engineering that is worth checking out. You can listen to the Taming the Fire Environment podcast by Sean DeCrane and Jack Murphy. Check out Structural Stability of Engineered Lumber in Fire Conditions at UL University.